The Yabby is a member of the family Parastacidae. They possess broad, spade-like claws, a short smooth rostrum (forward projecting spine between the eyes) and are generally pale to dark brown in colour. Yabbies are vigorous burrowers and are very resilient, being able to withstand poor water quality and long periods of drought. 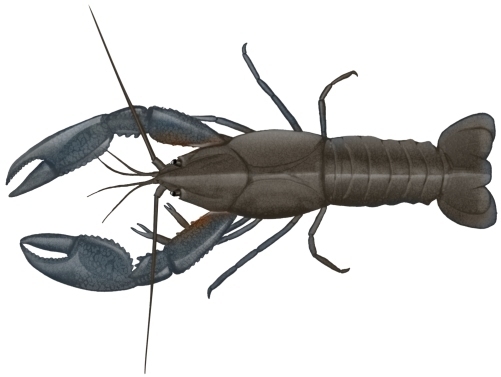 The scientific name "destructor" actually refers to the Yabby's tendency to burrow into levee banks and dam walls where they can cause considerable damage. Yabbies are detritus feeders and opportunistic carnivores. They are also cannibalistic. Yabbies can reach a carapace (upper shell) length of 7 cm or 16 cm total body length. Yabbies are found in much of central and western NSW, south western Queensland, the majority of Victoria and the eastern part of South Australia. They inhabit freshwater creeks, rivers, lakes, farm dams, swamps, floodplains and irrigation channels. They prefer to occupy turbid shallow water that is slow flowing or still. They can be found at depths up to 5 m depending on dissolved oxygen concentrations.